A while ago I told you about a competition with jeans. 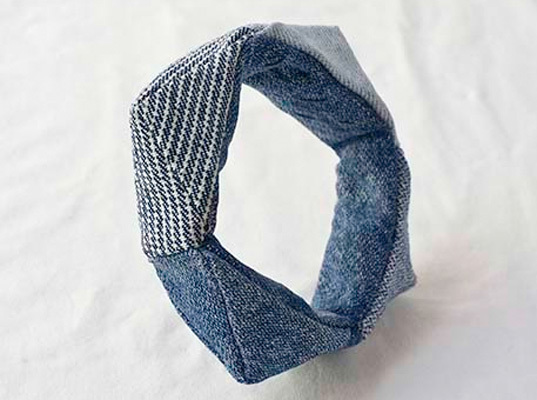 Now I’ve found a new way to recycle/upcycle your old jeans: Deadjeans. A company devoted to giving old jeans a second chance. They make pockets for iPhones and BlackBerry’s. how? Well, its simple. Make an order. An envelope will be send to you. Carefully remove both of your back pockets and send them back in the envelope. And voila: for only € 29,95 you’ll have a unique, personal and numbered pocket for your smartphone! Want to be creative yourself? Well, you can try it out. Recently I’ve been creative with an old jeans of mine. 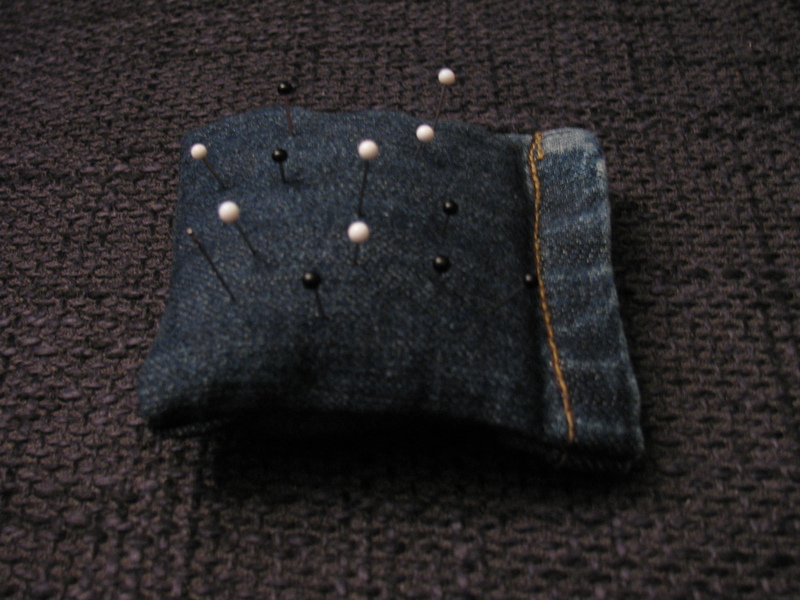 I made a pin cushion. Very fashionable (can jeans ever be out of fashion?) and made to last! And not to mention very sustainable. My first love is and will be heels. And I fell head over heels for these purple leather gladiator highsies from Zara. And for an astounding € 12,50 they’re yours! Want a cute dress to make a statement? Well, with this red dress you will stand out. 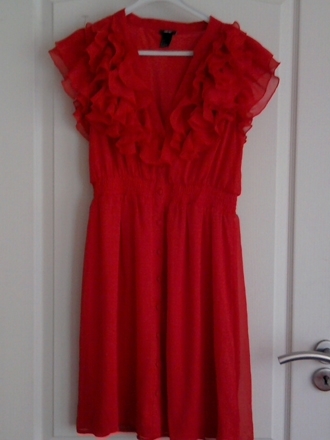 It’s from H&M (for only € 20,-) and will make you long for summer nights on the beach. 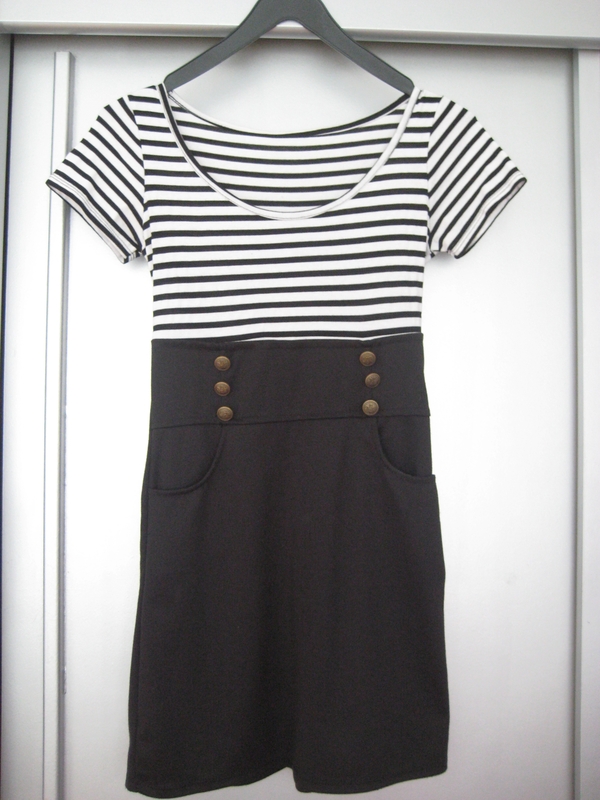 A great example of great style for almost no money is this navy inspired mini dress. Add killer legs and for € 7,- you have the recipe for a trendy outfit. Not blessed with ever ongoing legs? Cheat with pumps. 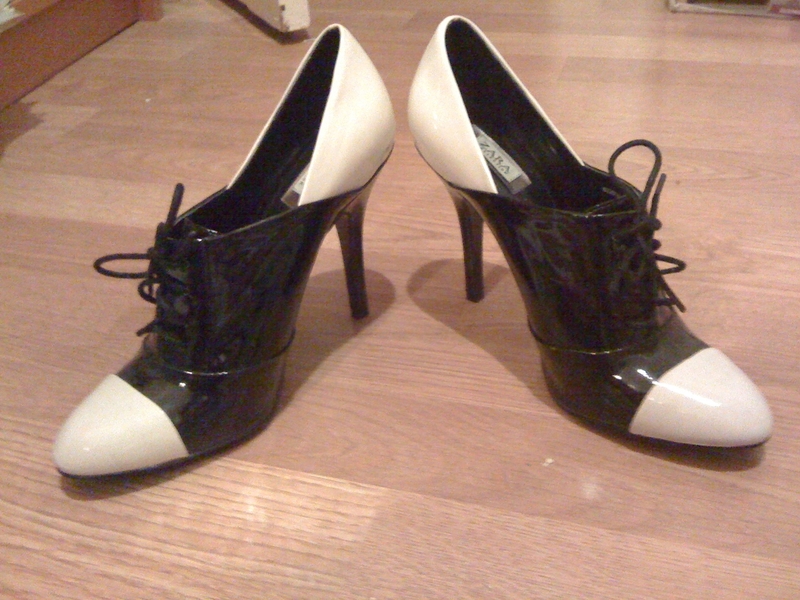 These black and white heels match perfectly and for € 47,- in total you will have an outfit. Well I hope you found these tips inspiring. Want to see something in another style? Don’t hestitate to make suggestions! Don’t forget to sign in! A few weeks ago I told you about the Recycled Denim Challenge. Well, the entry has closed and the finalsist are on line. Here’s my top three. If you want to support these (and other) initiatives, go to the website and vote! Sounds familiar? So many times you have jeans that have a hole but on the hole are still good. Well, just found a solution. 🙂 I came across a very original contest. Gap’s organising a contest for originals who reincarnate their jeans. And the winning design will be featured on Ecouterre, Inhabitat, and the Gap 1969 Stream. And the $200 Gap gift certificate you can win doesn’t sound so bad, does it? Oh, and you have ’till the 20th. Good luck! I’ve got a new series of DIY. This time it’s all about re-using things you normally trow away. This first episode is about tapes. 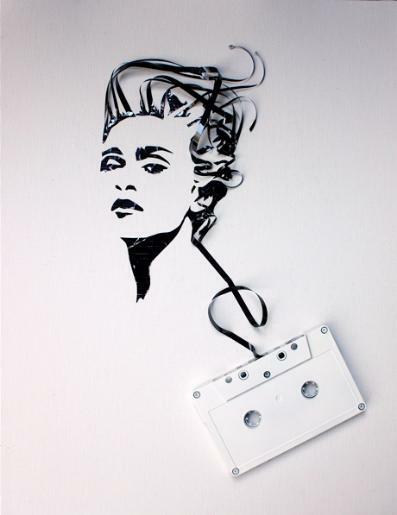 Alas, the world is changing and taping your favorite Madonna tracks are history. But don’t fear, you can re-use them! How? Here are a few tips. Erika Iris Simmons, aka iri5, makes gorgeous portraits out of old. They’re very precise and an eye catcher in every music lovers home. I’m proud to let you see that we Dutch people are very creative. 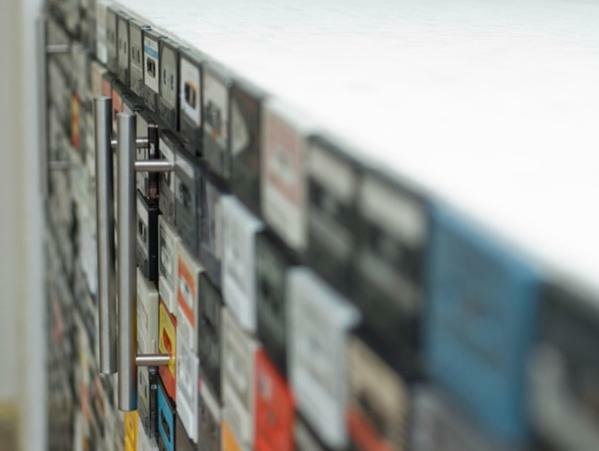 Designer Patrick Schuur used his screwer to decorate his drawer with old tapes. Maybe an idea if you have loads of time? I think it’s rather cool, very nice to see in a clean room. 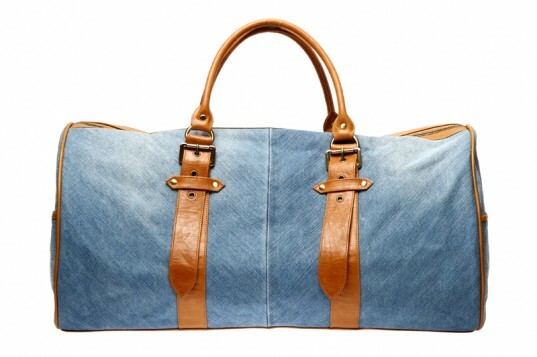 If you’re going to, let’s say, Glastonbury, you want to take everything with you without carrying a huge bag. And of course you always want to stay in style. 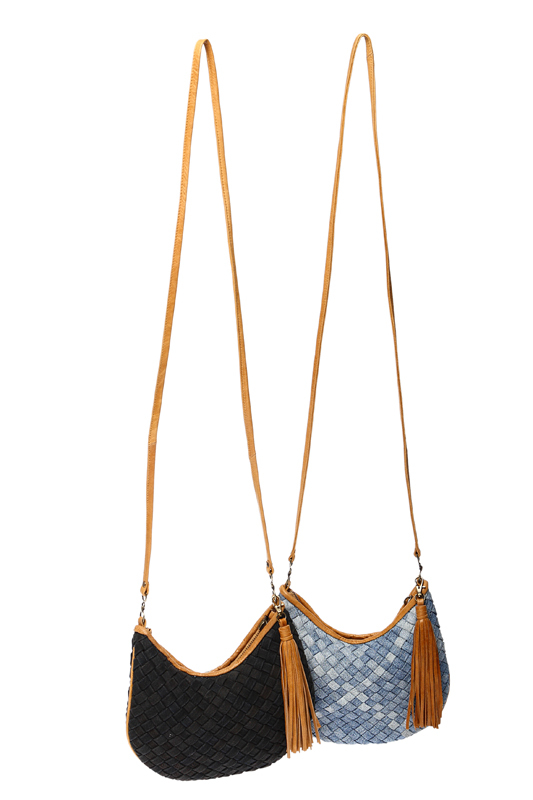 With this purse you won’t need to use your bra or wellies as your wallet. Feeling crafty? You can find the ins and outs on this website or, if you’re a bit lazy, buy one here. 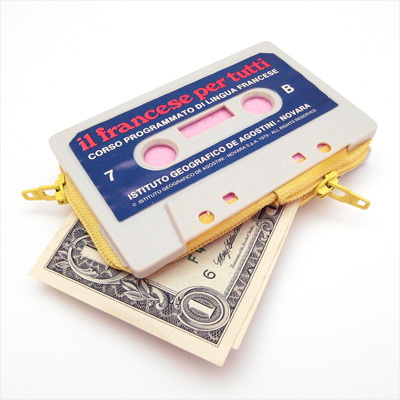 You might have noticed it: tapes are hot on necklaces. I’ve seen golden tapes hanging on chains at H&M, so it HAS TO BE hot. And sure you’ll be more in fashion with Run DMC than with the soundtrack of The Bodyguard, but you’ll make a statement anyway. Interested? Check out this video to see how to make your own diy tape necklace.